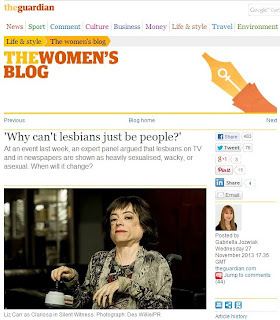 My blog for the Guardian Women's pages presents the arguments voiced by top gay female journalists at an event I organised with Women in Journalism and Diva magazine. My idea for the debate followed Diva magazine's launch of its Everyday Lesbophobia campaign. The event prompted three comment pieces in total, and plenty of Twitter activity under the hashtag #WIJlesboph. You can read my article in full here. How interesting and unusual your idea sounds! Nevertheless, I am very proud of you. Organizing such an event may require a lot of work. Thanks for the sharing your full article. You've gained a lot of success and appreciation.